Zenaida Cellars owners Eric and Jill Ogorsolka know something about the famous Templeton Gap that a lot of newer winery owners don’t. Just ask Jill why Theatre Drive in Templeton is actually called Theatre Drive. 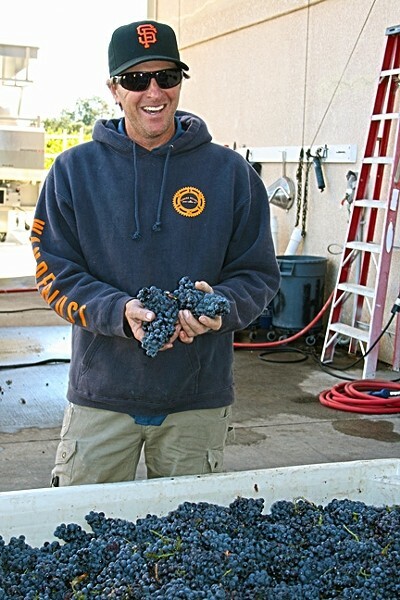 FRUITFUL : Zenaida Cellars owner/winemaker Eric Ogorsolka is rich with mourvedre grapes this harvest. This was back in 1996, long before the intersection of Theatre Drive and Highway 46 West symbolized the beginning of a celebrated wine trail winding from vineyard-dotted hillsides to Cambria waters. This was before “coveted Willow District” fruit and “romantic Templeton Gap breezes” graced the back labels of wine going for $40 a pop. This was way back, before Paso Robles had been divided into various sub growing regions—a million years before it was named 2013 Wine Region of the Year by Wine Enthusiast magazine. It was a real Wild West, and the Ogorsolkas were trying out this crazy idea of making fine wine on the Central Coast, hundreds of miles south of famous, predictable Napa. Now, Eric is known for his bold, uniquely “Paso Robles red blends” that sing with Templeton Gap terroir. Just say, “Zephyr” or “Fire Sign” to any winemaker of a certain age, and they’ll nod knowingly. But, it could have all turned out oh so differently. As the story goes, Eric could have wound up studying plankton or fish, not zinfandel and yeast. This was around the year 1990. Something clicked in Eric, who went on to studied oenology at UC Davis and—in 1996—planted his Templeton Gap vineyard. Two years later, he built the winery from the ground up. The rest is history in a glass. Jill’s own journey to wine country, wasn’t straight from point A to point B, either. Like many kids raised rurally, Jill swore she’d plant roots in more exotic soil. She didn’t get far before she was called back home again. 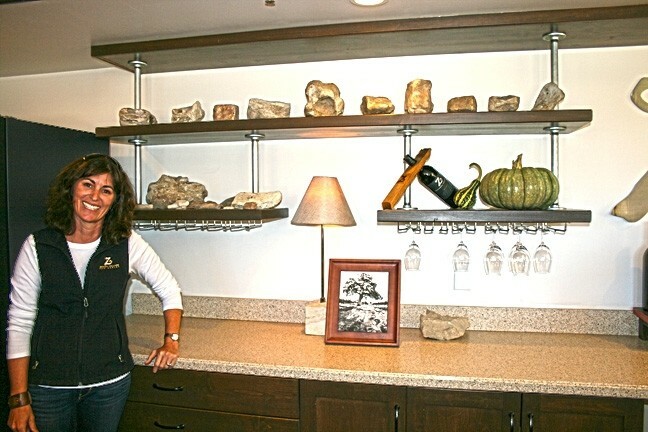 OLDIE BUT A GOODIE: Zenaida Cellars owner Jill Ogorsolka shows off shelves of ancient fossils lining her tasting room walls. “When I went to school at UCSB, it was night and day culturally. I got really into food and wine, and I had the opportunity to work at restaurants with amazing wine lists,” she said. Now, Jill looks back at her younger self, and can’t help but chuckle when she thinks of the first moment she saw a Paso wine on a fancy wine list. Say what you will about the firestorm surrounding the current ownership of JUSTIN Wine today. What Jill experienced that night was the power of the then locally owned winery’s Isosceles cabernet sauvignon blend, which would go on to be touted as sixth in the world by Wine Spectator. It was riveting; a real game changer. Now, Zenaida’s offerings are giving wine critics the world over that same enlightening moment of clarity (yes, many wine experts still don’t know where Paso Robles is on the map, much less a sub-AVA). Those who are in the know, however, have long since believed that there’s just something special about Paso fruit—especially the supremely balanced fruit grown in the Templeton Gap, which boasts cool marine breezes and dramatic temperature swings. From where I’m standing, it’s undoubtedly true. Harvest was in full swing during a recent tour, where baskets of shockingly purple mourvedre grapes basked in the late morning sun. The hum of the crusher/destemmer provided a productive winemaker’s hymn. “This baby can do 4 tons per hour,” Eric said, watching the fruit of his labors pass from a conveyor belt to a hand-sorting station manned by nimble fingers. A PASO CLASSIC: Zenaida Cellars is located at 1550 Highway 46 West in Paso Robles and open daily from 11 a.m. to 5 p.m. For more information, go to zenaidacellars.com or call 227-0382. The winery currently uses fruit from the estate vineyard and sources from other local vineyards for their portfolio of wines, which include zinfandel, syrah, cabernet sauvignon, and petite sirah. Nestled at the base of the Santa Lucia Coastal Range, the couple’s 35-acre property consists of 22 acres of sustainably farmed vineyards, and Eric knows them all by heart. Along with Jill and their two young kids, the couple has walked the rows countless times. “We have date sheets on every wine going back to 1999,” Eric said while checking on dozens of bubbly fermentation tanks stored in a converted barn (Jill does the record keeping and business tasks while her husband sweats in the field). History, it seems, is alive at Zenaida Cellars, even as it hurtles into 2017 and beyond. The winery occupies the original homestead of the property, dating back more than 100 years. The couple farms the land much as folks did back in the day: Utilizing the same low-impact philosophy in the vineyard and in the winery, Eric maintains that farming and living sustainably will not only produce higher quality wines. It will also help leave the land in better condition than how he found it. Now, the 40-somethings are becoming the “old timers” of the area, a winery for newbies to watch and learn from, if they should be so wise. Note: Zenaida boasts one of the only tasting lists that gives its members such increasingly good deals every year that a member stays part of the family. Times may have changed in Paso Robles—hotels where there were none, more than 200 wineries where there were few, and a downtown tasting room scene to be envied—but the Ogorsolkas have kept their cool. For them, it still feels cozy in Paso, and the “howdy neighbor” vibe lives on. “Now we’ve all gotten married and the kids are growing up, but we still maintain that we have the best little neighborhood of winemakers out here on 46 West,” Jill said. Hayley Thomas Cain is impatient for those mourvedre grapes to become big, bold, and bathed in alcohol at hthomas@newtimesslo.com.